LEGO Star Wars Duel on Geonosis features falling lamps, tower handle and hidden compartment. Includes 4 minifigures with weapons…. 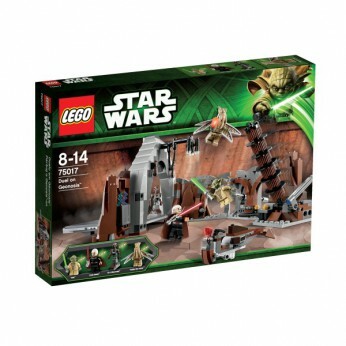 With this LEGO Star Wars playset, stop Count Dooku from leaving Geonosis with the plans for the Death Star! Use the Force to help Jedi Master Yoda jump into the air, dodge the Sith Lords Force Lightning attack and bring Dooku to justice. Dont let him destroy the lair and escape on his speeder. LEGO model number: 75017: Includes Count Dooku, Yoda, Poggle the Lesser, Dookus Pilot Droid and 2 lightsabers. The lair features falling lamps, a tower handle and a hidden compartment. For ages 8 years and over; EAN: 5702014974814. WARNING(S): Not suitable for children under 3 years old. To be used under the direct supervision of an adult. This toy costs approximately £39.99 (for the latest and best prices make sure you check our retailer list for the LEGO Star Wars Duel on Geonosis 75017 above). In our review of LEGO Star Wars Duel on Geonosis 75017 we classed it as being suitable for ages 6 years, 7 years, 8 years but recommend you check the manufacturer specific advice before purchasing.